I truly believe when Tony Bennett left his heart San Francisco, it was because he knew he’d never find a better Clam Chowder than by the Bay. Or maybe bread bowls weren’t his thing…maybe he was talking about the abundance of bodacious burgs which adorn this fine city or even the seaside sundaes which are aplenty around the Golden Gate. Long story short…San Francisco has some great places to eat ya’ll. But there’s a specific special selection of treats I absolutely cannot resist whenever I find myself in this marvellous City. San Francisco is the famous home for some of the world’s steepest streets and calf-killing hills, but the views more than make up for the moans and groans you make burning the calories to get to the top. The first thing you absolutely must pick up and devour overlooking the Bay is the Clam Chowder from Boudin Bakery, served in their world famous Sourdough Bread Bowl. The perfect lunch to warm your bones after battling the breezy sea air, the stew is thickened to perfection until ridiculously creamy and comfortingly rich. Tear apart the lid and dunk. After you’ve finished the soup, I thoroughly encourage you to rip hunks off the bread bowl, close your eyes and enjoy the chunky morsels of fluffy sourdough now soaked with the luscious flavours of the soup. It’ll honestly be one of the best things you put in your mouth this year. There’ll be many a restaurant along Fisherman’s Wharf claiming to host the creamiest chowder on the block – but resist the temptation and head straight for Boudin, those fellas have been going since 1854 and deliver nothing short of perfection. A short walk from Boudin Bakery, you’ll find possibly the dreamiest Soda Fountain this side of California. AKA Mecca, where I belong. Originally a chocolate factory established by Mr Ghirardelli himself (a pretty remarkable gentleman who knew his way around a cocoa bean), this complex is now home to a chocolate box selection of restaurants, independent shops and most importantly the hub of Ghirardelli Chocolate. Claim your spot in the queue and grab yourself a menu to tease yourself with before you order. The line moves fast, so be bold and place your order with the cashier before finding a spot to satisfy your sweet tooth. Your order will be delivered to you by one of the smiley servers, dapperly-clad in braces and flat caps which simply adds to the magic. I recommend finding a table with good view of the assembly area – if you catch a glimpse of the whipped cream machine – that’s the beautiful beast that’ll be on my birthday list this year. In my humble opinion, you only live once and you most certainly won’t be eating like this every week (unless your extremely lucky and have the metabolism of a greyhound). So don’t be shy with your order. Order the Crissy Fields (my personal favourite). Classic vanilla ice cream nestled between some of the most decadent, chunky cookie and cream ice cream I’ve ever had, lashings of handmade hot fudge sauce, whipped cream and generous crumbles of Ghirardelli’s Colossal Chocolate Chip Cookie. Satisfying, sumptuous and dangerously more-ish. Added bonus: You’ll feel like Kevin Mccallister circa Home Alone 2 : Lost in New York when devouring this mountain. Don’t ask me why, but sundaes always taste 10 times better when consumed out of a giant glass goblet. Ghirardelli’s Treasure Island is living proof of such a fact. A truly sensational invention, classic scoops of vanilla ice cream are paired with a rich, warm Ghirardelli Chocolate Brownie fresh from the oven and drenched with their handmade hot fudge. A cloud of whipped cream, chopped almonds and a maraschino cherry are the final flourish to this god send. Trust me when I say you’ll taste heaven with every single bite. And just in case you have room for more, may I recommend the Lands End? Impossibly rich, indulgent and frankly irresistible. This melt-in-your-mouth sundae combines two large portions of vanilla, flanked by two warm Ghirardelli Chocolate Brownies and smothered with creamy caramel, handmade hot fudge and sea salt. Be sure to scoop a taste of every layer onto your spoon, the sugar coma is worth every lick. Trust me when I say, there is no way you can go wrong with any order from this joint. So listen to your cravings, give in to your most inner-depth desires and most importantly, wear stretchy pants. If you’re looking to dine more on the savoury side of San Francisco, let’s take a stroll down to Anchorage Square. 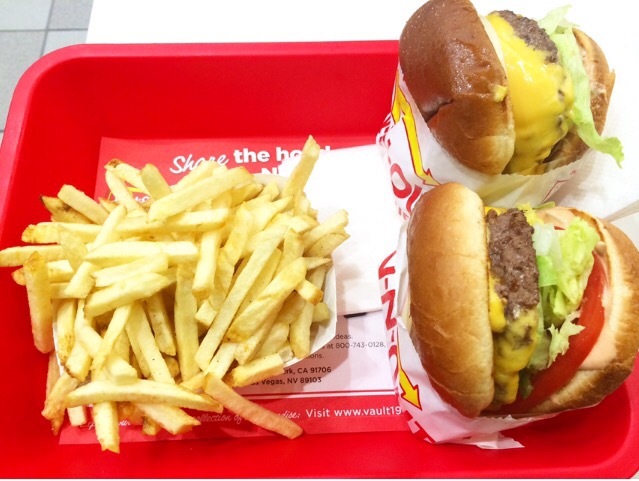 When you find yourself this side of the West Coast, I feel you simply must make time for the elusive In-N-Out burger, available only in the California state. Be sure to order the Double-Double. Two thick hunks of pure-beef patty, cuddled between two fluffy buns and stacked with a wedge of fresh salad make for a super succulent bite, made somewhat more delicious by the novelty of eating them straight out of their paper bag holders. The melted cheese flavours the chucked meat marvellously, resulting in tender, juicy, meatalicious chomps, so good you won’t even care that the remnants are dripping down your chin. Admittedly, the fries aren’t great, slightly cardboard-y in texture and lacking in flavour. Skip these and grab a shake to make up for the lost calories. If you’re looking for an additional bonus to this beast of burg – it’s hella cheap and you get a free hat when you dine in! Another Burger Chain you HAVE to try is exclusive to San Francisco and has seen multiple locations pop up here, there and everywhere in recent years. Bold by name, bold by nature, this beauty is packed full o’ delicious meaty flavour and should be high on your list of burgers to try if you find yourself in the area. Super Duper boast the finest and freshest ingredients made available which is evident in both taste and texture, it takes work to make a truly clean burger taste this dirty and their buns are even baked especially for them by an artisan baker locally in San Francisco. Order the Super Burger with Super Sauce (I’m not 100% sure what this is exactly, all I know is I want to take a bath in it). Roll up your sleeves, get stuck in and enjoy each and every eye-rollingly filthy bite. Definitely order the Garlic and Parmasen fries (they’re super naughty and you’ll smell like them for days but you definitely won’t care). And ABSOLUTELY order the Cookies and Cream shake to wash it down with. The final must-eat I can’t resist but share with you is somewhat of a guilty pleasure for me. Alas, I am not ashamed. It’s processed, embodies enough additives to induce diabetes and has almost certainly not been crafted by human hands. …but the heart wants what the heart wants. The Cheesecake Factory Red Velvet Cheesecake. Now this is not San Francisco specific. You can take out this little slice of heaven in almost every state of the US, however for me it’s the view you get to eat up with this frosted filly with that’s the real icing on the cake. Take your slice in it’s cute little take-out box and take a stroll East to the Ferry Building where you’ll find a delightful view of Bay Bridge. Sit back, don’t make eye contact with the seagulls and enjoy soft and devilishly sweet spoonfuls of American Red Velvet sponge, topped with lip-smackingly smooth white chocolate, cream cheese frosting. Well that wraps up just a handful of my most favourite eats when dining al Francisco. Have I tempted you? I sure hope so. regularly, this website is really nice and the visitors are actually sharing good thoughts.